MPLAB is an Integrated Development Environment (IDE) which is a free, integrated toolset for the development of embedded applications employing Microchip’s PIC® and dsPIC® microcontrollers. MPLAB IDE runs as a 32-bit application on MS Windows®, is easy to use and includes a host of free software components for fast application development and super-charged debugging. MPLAB IDE also serves as a single, unified graphical user interface for additional Microchip and third party software and hardware development tools. Moving between tools is a snap, and upgrading from the free software simulator to hardware debug and programming tools is done in a flash because MPLAB IDE has the same user interface for all tools. Download MPLAB IDE and use the tutorial in the MPLAB IDE User’s Guide at the bottom of this page to explore how easy it is to create an application. Write assembly code, build and assemble your project with MPLAB’s wizards, then test your code with the built-in simulator and debugger. 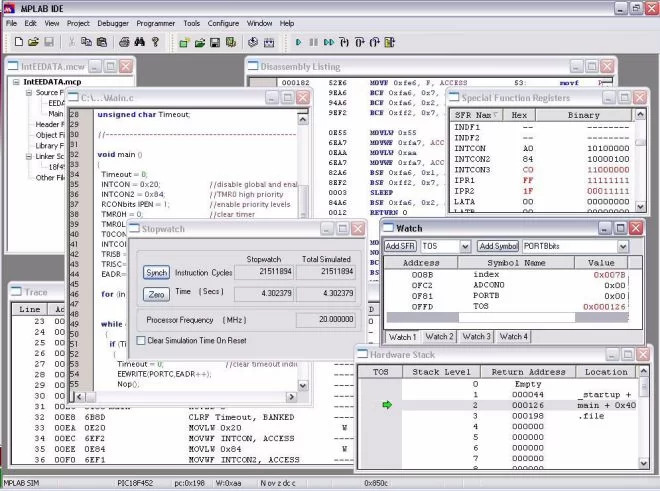 When you are ready to test your own application, select one of our low-cost debugger/programmers to program a device and analyze your hardware.